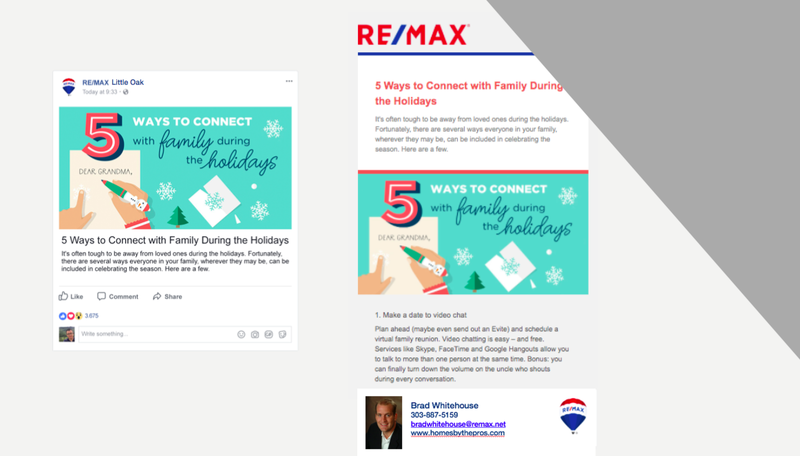 Re/Max has launched Social Prompt for Re/Max, a new social media tool created by BombBomb that provides Re/Max affiliates with pre-written “timely, consistent and brand-aligned posts” to be shared on Facebook and other social media platforms. “We’re excited to introduce a social media platform that provides posts to consumers and agents and, upon review, automatically posts on behalf of the Re/Max affiliate — saving them time and resources,” said Steve Pacinelli, BombBomb’s’lpl chief marketing officer. To join the program, agents and broker-owners must attend a live 30-minute online webinar that explains how Social Prompt works, and then sign up for a free BombBomb account. From there, they’ll begin receiving four pre-written and pre-designed posts per month that are automatically posted on Facebook. Agents will receive a notification before the post is set to publish, which gives them enough time to make edits or reschedule. Post topics will include agent recruiting and retention, information on national housing trends and trending topics that are currently at the center of the real estate and housing markets. When a user clicks through the posts, they’ll be led to a landing page that features the agent’s logo, headshot and contact information. An example of the posts Re/Max agents will receive. Agents who want to up the ante can opt into a premium plan that enables them to create personalized videos that accompany pre-written posts, and the ability to post on multiple social media platforms. According to the brokerage, the tool was created in response to a survey where 59 percent of Re/Max agents said they’d like additional social media promotion support and another 41 percent requested client relationship management software support. “Our network of affiliates are known for continually pushing themselves to excel in all aspects of their businesses, so it’s no surprise they want to elevate their social media presence in 2017 and beyond,” said Pete Crowe, Re/Max’s senior vice president of communications and marketing, in a statement.